The first thing to admit when discussing this movie is that we are here for the cheese, but the cheese does not define us. I feel obligated to give a big disclaimer whenever I review a B-movie like this because so many people seem incapable of enjoying low-brow cinema. YES. This movie is bad. but it is a bad movie with a ton of charm, action that rewards repeat viewings, and a sweetness that feels welcomely-naive. You can't compare a bad movie like Yor to a bad movie that cost hundreds of millions of dollars to make and is spiteful. 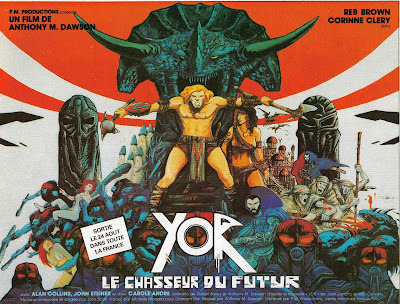 Yor is a party movie; you don't watch Yor and find yourself feeling worse about the world; you feel the opposite. I want Cereal At Midnight to be a safe place to love bad movies. Not ironically, not because we're so much better than them, but because bad movies can be a ton of fun, ESPECIALLY when they're made for very little money and everyone involved in their creation was swinging for the fences. With that out of the way, Yor delivered exactly the experience I was hoping for. Reb Brown, the guy who played Captain America in a 1979 TV movie, is the title character, a barbarian who seems to be the polar opposite of Conan, which no doubt was a big influence on this movie. In fact, Yor is such the opposite of Conan that the first time we meet him, he's running down a hill into the sunlight with a smile beaming on his face. I was hooked. The movie quickly establishes that we're in what appears to be a primitive age, Yor is a wandering barbarian with killer warrior skills, and there are other primitive people who need protecting. And that's when the dinosaur attacks. You want to start your movie the right way? Open it up with a dinosaur attack within the first few minutes. Then have your main character drink the blood of said dinosaur and say something awesome like "The blood of your enemy makes you stronger!" Indeed, Yor. Indeed. Something akin to a quest follows, and along for the ride with Yor are Italian-character-actor Luciano Pigozzi and a genuine Bond girl (from Moonraker), Corinne Clery. I'll spare you the plot details because they really don't matter, but we find ourselves about an hour into the story when this movie absolutely becomes a completely different thing. 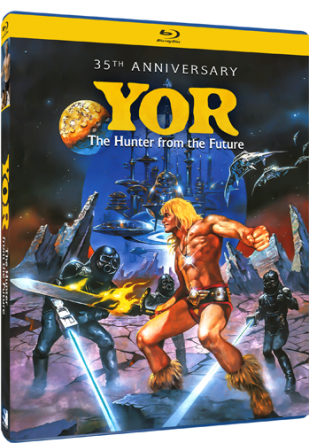 They spoil the twist with the title so I can write about it here: Yor is indeed from the future, and the last half-hour is a space opera. We've hit on something that I really appreciate about this film. For all intents and purposes, this is He-Man and the Masters of the Universe before that was a cartoon or a movie. Okay, if we're splitting hairs, the He-Man toy line debuted in 1982 and the cartoon from Filmation premiered a year later in 1983, the same year this movie was made. But what are the chances that the director of this movie, Antonio Margheriti, was watching He-Man cartoons? It seems like there was just something in the air during the early years of the 1980s, and everyone was both chasing Star Wars and also embracing sword and sorcery movies. Which brings me to another thing I really dig about Yor. Yes, this is a barbarian movie like Conan, and it's a sci-fi movie like Star Wars, but ultimately this is a sword-and-sandal flick from the people that actually created the sword-and-sandal genre. Being an Italian production, it has all the benefit of being a legitimate peplum film in the grand tradition of the Steve Reeves Hercules films and shows a clear look at the 1980s peplum renaissance. As a piece of Italian cinema history, it's a crucial entry. Goofy, but crucial nevertheless. 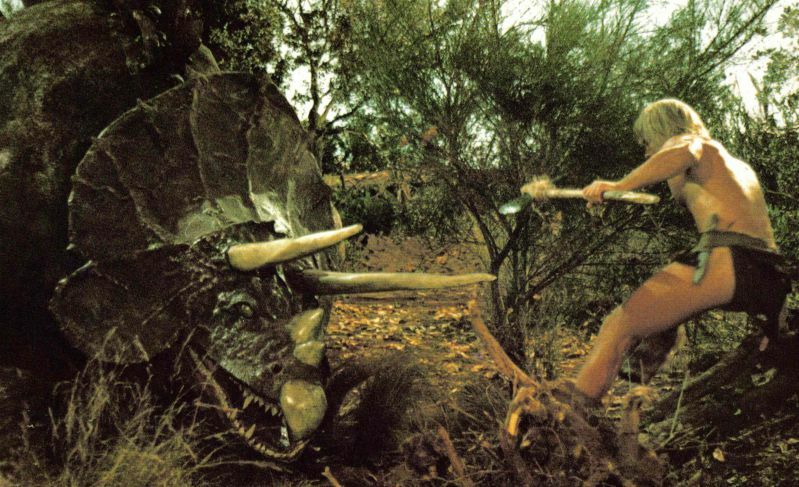 What I've learned since watching Yor is that it started life on Italian television as a four-hour miniseries. Though I think there are some bootlegs of that original television broadcast circulating, I don't think that version ever saw an official release. If it did, it certainly never made it to the States. Maybe that's for the best, as the 88-minute cut on the new Blu-ray presents a quick experience that has little time to slow down and focus on the elements that make take us out of this crazy make-believe world. Get beyond the bad acting, the bad wigs, the crazy story elements, and the robots that look like a cross between a Cylon from the original Battlestar Galactica and Darth Vader, and there's actually a whole lot to like. With clear budget limitations, Margheriti was forced to rely on things like beautiful shooting locations in Turkey, where this movie filmed. Turkey seems to have everything this story needed: unique, rocky spires, deep caverns, lush forests, and beautiful blue seas. Just like New Zealand gave us Middle Earth, Turkey gives us a rich, living world tailor-made for a movie like this. Furthermore, Reb Brown, while no Shakespearean actor, throws himself into this part with enthusiasm and a lot of charm. He had to have known that he wasn't making high art, but he seems like such a good sport. And given that he provides a brand new audio commentary for this release, he's STILL a good sport all these years later. I also have to acknowledge that Reb Brown had a killer physique in this movie that must have taken a lot of work to achieve. He doesn't have that ridiculous body that Stallone and Schwarzenegger were known for, but he probably didn't have to get 'roided out of his head, either. He has the body that makes me feel like if I spent a little more time in the gym and ate less carbs, maybe one day I could achieve the same thing. It's just hard to come away from this movie not liking Reb Brown. This movie comes to us courtesy of Mill Creek Entertainment, a distributor I've taken great lengths to praise in recent weeks. Mill Creek is not a company known for frilly releases. In fact, most of the time they provide the exact opposite. I've come to view the company as something like an anti-Criterion, putting populist entertainment in the hands of people eager to see the stuff that has fallen through the cracks and doesn't get much recognition from the cinematic establishment. With the home video distribution market fragmenting into various high-priced collector niches, Mill Creek has occasionally felt like the punk rock kids making posters and t-shirts in their basements--and I mean that as a compliment. With that being said, I notice a clear upward trend in quality when it comes to Mill Creek's releases, and Yor is one of the best so far. 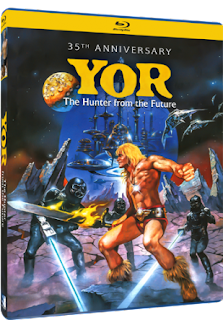 I made a video about this and a few other Mill Creek releases, and I bragged on this release for exhibiting two pieces of promotional art associated with Yor, the Hunter from the Future. One is on the disc package itself and the other is on a nice slipcase. The only improvement on this would have been having a third piece of art (seen below) as a reversible cover, but I honestly feel guilty even bringing that up. This release is already above my expectations. I can't comment on the specs of the Blu-ray itself, such as the Blu-ray disc capacity and how much space is used, but I can comment on the quality of the transfer. In that regard, Yor looks just fine. It's certainly not beautiful, but for my tastes and for the kind of movie this is, it looks really good. It's miles better than the screenshots I've seen of the previous standard-definition release from years ago and way better than the washed out video tape image where this movie lived for decades. Dirt and artifacting are present, but to me, those things just remind me that this is FILM and not some slick digital production. The transfer won't blow anybody away, but it's definitely HD, and we're lucky that it looks as good as it does. I think I speak for all of us who grew up during the VHS era when I say that we never thought a cheap movie like this could look as good as it does. 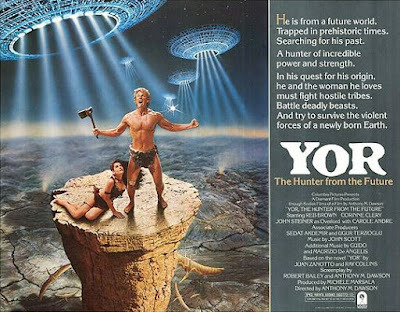 So while Yor may be Antonio Margheriti's secret shame (I actually think he enjoys how bad it is), it's a real delight for genre movie fans eager to take a step into Yor's world. This one was made for midnight viewings, which, coincidentally, is just when we're pouring our first bowl of cereal.